A BLOG ABOUT HAIR,MAKEUP,FASHION,LIFE AS A TEENAGE MOM AND JUST MY RAMDONESS. SO TODAY I JUST WANTED TO FEEL PRETTY. IM NOT A GIRLY GIRL OR BIG FASHIONISTA BUT I DO LOVE TRYIN NEW THINGS. SO TODAY I PAINTED MY NAILS STRAWBERRY OR WATERMELON. I REALLY DNT KNO WHICH ONE TO CALL IT BECAUSE IT LOOKS AS IF CAN BE EITHER. 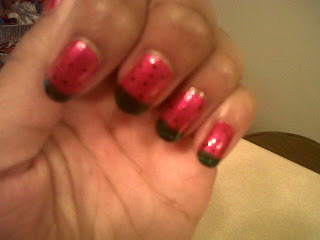 IM NO ARTIST BUT I DID TRY SOME DIFF. SO I GUESS IMMA DO AN OUTFIT OF THE DAY LATER WITH THESE NAILS. Hello everyone I'm Lynn an aspiring makeup artist and Fashion consultant. I love everything that deals with fashion and beauty. I live for lipsticks and mixing and matching patterns. My blog has a little of everything so I hope you enjoy it as much as I do writing it .